history is being made in Rivers State with the swearing-in of Dr (Mrs) Ipalibo Banigo (Nee Harry), as the first female deputy governor of the state. When the Peoples Democratic Party’s governorship candidate at the just concluded general elections, Chief (Barr) Ezebunwo Nyesom Wike announced Dr (Mrs) Ipalibo Banigo as his running mate, people reacted differently. While many, particularly the femalefolk saw it as a positive step towards gender equality in the state and Nigeria at large, others considered her candidacy as a ploy by PDP to garner the female votes. Ours being a society where some people believe nothing good could come from a woman, some could not accept that a woman is fit to occupy the exalted position of a deputy governor. But looking at Dr (Mrs) Ipalibo Banigo’s track records over the years right from her secondary school days at Queens College, Yaba, Lagos, it is obvious that whoever nominated her for the plum job must be an informed and wise person who meant well for the state. Certainly, no other person could have been more suitable for the great position of high responsibility than this outstanding administrator, a core civil servant who has served the state in various capacities like the Head of Service, Secretary to the State Government, an acting Commissioner, Permanent Secretary, Director General, Rivers State Ministry of Health and Social Welfare, Principal, Rivers State School of Health Technology, Honorary Consultant Dermatologist, University of Port Harcourt Teaching Hospital and many more. To equip herself for these responsibilities, this 63 years-old lady of excellence from Obuama in Degema LGA, Rivers State attended some of the most prestigious institutions in the world, like University of Ibadan, Harvard University, School of Public Health, and University of London. This mother, grand-mother, a woman of substance is seen by many as a valuable gift to the state. Her close associates describe as a jovial person who radiates joy whenever you are around her. Civil servants say she is the defender of the defence less, recounting how she used her position as the Secretary to the State Government to fight for the rights of the workers during Capt. Sam Ewang’s administration. The questions then are: how will Dr (Mrs) Ipalibo Banigo use her wealth of experience and knowledge to impact on the lives of Rivers people? What advantages will accrue to Wike’s government on account of having a woman so richly endowed as a deputy? What are the expectations of Rivers people, especially the women from her? Mrs Maria-Goretti Obichere, a teacher had this to say, “I expect that with a woman as the deputy governor, the plight of women in the state will change. We want women to be recognised. We don’t want any more discrimination. She should make effort towards the empowerment of women in the state. Our children are very important. We want schools in the State to be what they should be so that our children will have proper and quality education expected of them? Mrs Obichere believes that having a female deputy governor is a big plus to Wike’s administration, because, according to her, a woman is a symbol of peace and love. Peace is expected to reign in the state throughout the life of the new administration, emphasising that the new deputy governor should be a competent solid help mate that would work with the governor in the interest of the state. 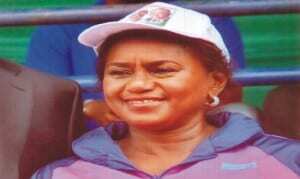 Similarly, Barr Veronica Ogbozo said all that is expected of Ipalibo Banigo is to carry women along in her programmes. She said going by her antecedents, the deputy governor will not be dormant but will make a great impact on the administration. Barr Ogbozo said, “she is not just a woman, she is a mother, a grandmother. To me, I think she’s going to work with the governor like a mother, directing him, advising him. You know Wike is a youngman, so he needs somebody of that calibre, a mother, a backbone, telling him what to do if he will listen, and I’m sure he will be able to listen”. In the views of Mrs Lilian Okonkwo, Rivers State Chairman of Nigeria Association of Women Journalists (NAWOJ), the historic deputy governor is expected to adequately tackle the issues concerning women and children. She said the Deputy Governor should take interest in the Ministry of Women Affairs, ensure that adequate budget is made for the ministry and that the funds are released and properly used for the development of women. She said in addition to her role as a deputy governor, it is expected that she would play a motherly role to the state particularly in the area of taking care of women, children and men when the need arises. The NAWOJ chairman believes that having a female Deputy Governor is a credit to Wike’s administration, a step which she said was applauded by NAWOJ, FIDA and other women organisations which had been advocating the inclusion of women in leadership positions in the state and the country at large, adding that being a former Perm Sec, SSG, Head of Service, a Medical Director, a core civil servant, a mother, she is expected to bring her wealth of knowledge into the job by ensuring that civil servants have a better deal during this administration. In her words, “we all know that presently there are issues concerning salaries, wages, weigh-in and things like this in this state. I believe that she understands these things better than the governor who is purely a politician. She had worked as a civil servant, she knows the rudiments, she understands these things. So I believe she will bring in her wealth of experience and ensure the welfare of civil servants is improved in this administration. For Mrs Oby Ejezie, a business woman, Dr Ipalibo Harry-Banigo should ensure that the women particularly those at the grassroots are carried along in the scheme of things, saying, she should see herself as the spokes person for the women so that the issue of gender inequality will be a thing of the past in the state. She said she should not be a figure head in the Brick House, but should make impact so that the women folk will know that their own is there to represent them not just for her personal interest. Mrs Ejezie is optimistic that having the calibre of Dr Ipalibo-Banigo as a deputy governor will bring about peace and development in the state. In the opinion of Mr James Samuel, a driver, the new deputy governor should play a motherly role in Wike’s government, ensuring that there is peace and unity in the state and that everybody in the state, particularly the poor and the jobless are sufficiently catered for. To whom much is given, much is equally expected. Today, another feather is added to the cap of this illustrious daughter of the state and it is anticipated that together with her boss, the brand new governor of the state, Chief Ezebunwo Nyesom Wike, the people of the state will have a better deal.